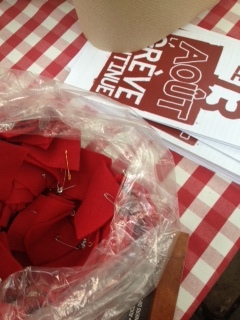 Late this afternoon — after slogging near brain-dead through the thick humidity all day — I almost decided not to schlep the five kilometers eastward for the Pique-Nique Rouge (“Red Picnic”) hosted by the Assemblée Populaire Autonome de Quartier (APAQ) de Rosemont-Petite-Patrie. What was supposed to be a short walk to grab a short-hop BIXI (public transit bikes) yielded only empty station after empty station, meaning a long walk in the blazing sun, drenching me in sweat. Fortunately, a flash of blazing red on a third-floor balcony distracted me: a red square, with the picturesque coincidence of sliced red tomatoes baking themselves underneath. I had to snap a photo, and then of course, I glimpsed another red square a half-block away, so onward I trudged, almost forgetting I was barely able to breath for the heaviness in the air — an added bonus of my obsession/passion for “Seeing Red” (http://seeingredmontreal.tumblr.com/). A bunch more photos later and at last a BIXI got me to Parc Molson. 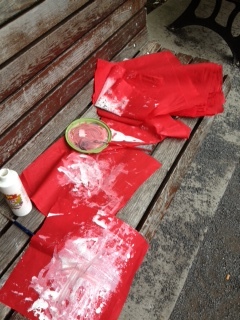 As we were shifting into assembly mode, I sat down next to a longtime Montreal anticapitalist organizer who I’ve known a good while, and he mentioned a piece I’d written 40 days ago, on night 63, titled “Lost in Translation: Maple Spring” (https://cbmilstein.wordpress.com/2012/06/26/lost-in-translation-maple-spring-montreal-night-63/), where I talked about various ways I stumbled on to meanings about that phrase supposedly capturing this movement. His key point was: a lot of people here don’t like that term. Before I darted off to resituate myself in the English whisper-translation section of the pan-assembly (basically, ridiculously, consisting of only me and my now-regular anarchist translator comrade), I got one more tidbit something along the lines of this: that “Americans” (like me) probably just think Maple Spring sounds cute, or don’t quite get it, because most of us don’t speak or understand French. 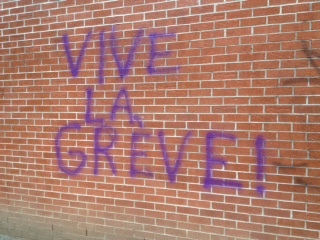 And this student strike — veering toward a social strike, or an attempt at one, if this pan-assembly is any indication — is definitely Francophone-driven, for better and worse. 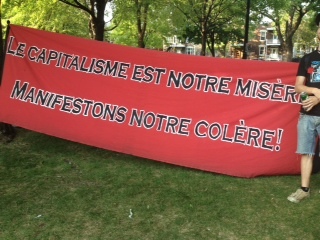 Because besides the language and other divides between Anglo and Francophone, there’s divides between many formerly French-colonized peoples in Montreal, such as the largest Haitian community outside Haiti, and further divisions between Anglophones/Francophones and the many Middle Eastern and Muslim people living in Montreal, not to mention many Chinese- and Spanish-speaking people and others. One of the two people sitting next to my friend added, I presume with a dose of irony, “It probably would have been more accurate to call it the ‘Fleurdelisé Spring,'” referring to the four white fleurs-de-lis on the Quebec flag that are symbols of purity, originally represented by the Virgin Mary, but gesturing toward the various sovereigntist sentiments that have been renewed through the student strike as well. 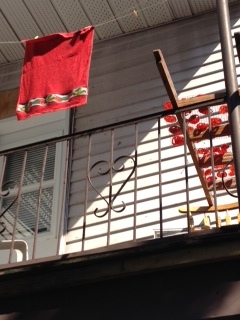 This entry was posted on August 5, 2012 by Cindy Milstein in Dispatches from Quebec Spring.